Home › Training equipment › What’s the Best Golf Swing Trainer? What’s the Best Golf Swing Trainer? Stuck in the office all day? Have a few minutes to spare and want to work out some of the kinks in your swing? These golf training devices will help you fix your slice, increase your swing speed, hit straighter drives, and hopefully help you shoot lower scores on the course. Below are some of best golf swing trainers available on the market. What it does: The SKLZ Gold Flex Strength and Tempo Trainer helps you create clubhead lag for longer drives, build core strength/flexibility, and develop a better tempo in your golf swing. Overall, this swing trainer will help give you flatter swing plane, which in turn will help eliminate slices. Who it’s for: The SKLZ Gold Flex is a great tool for all players, especially those struggling with slicing. In fact it has even been used by PGA tour players such as Vijay Singh, Matt Kuchar, and Fred Couples. It is also great for older players to increase torso flexibility. 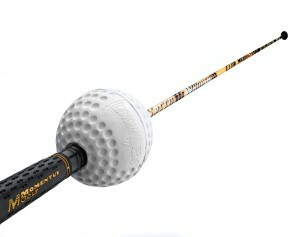 The Gold Flex is perfect device for stretching before a game, and to get a good swing rhythm before teeing off. What it does: Here is another great tool from SKLZ that does exactly as the name implies — improves your grip and swing tempo/rhythm. This small training club (approx 30 inches long) has a molded grip to ensure that your hands are always in the exact proper position. Changeable weights allow you to simulate swinging either irons (heavy) or woods (light), while also developing your flexibility and golf-specific muscles. Using this trainer will help give you a flatter swing plane, and elimiate unwanted slices. Who it’s for: The small size of this tool makes it the best golf swing trainer for practicing indoors at your office or home. It’s also very reasonably priced at only $25. If you don’t have time to get to the range before the game, then a few swings with the SKLZ Tempo and Grip is the perfect warmup. Note that this tool is only made for right handed players. What it does: Helps elimate the dreaded “chicken wing“. 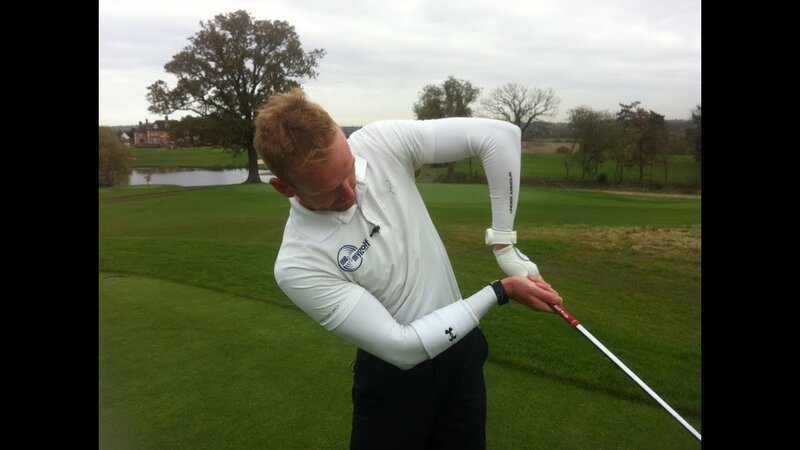 The IZZO Smooth Swing keeps your arms and body together for a tighter, more efficient swing. With a tighter swing, you will start to hit consistently longer, and more accurate shots. 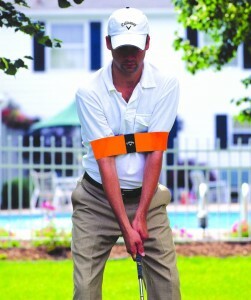 Who it’s for: Anyone that has that ugly chicken wing form in their golf swing. It is a simple, and cheap device that works. If you don’t mind looking a little bit dorky at the driving range, then you should try out the IZZO Smooth Swing. Overall rating: 4/5 – Simple device that does what it’s supposed to do, but you could also just use a large rubber bands to simulate the same effect. What it does: Helps you practice making proper club contact, and provides instant visual feedback. Just take a full swing at the SKLZ Smash Bag. then look at the angle of the target map to see how you did. If your swing was straight/true, the bag will remain aligned. If your swing missed the target or hit at a skewed angle, you will feel the miss, and the bag will also show with a skewed indentation. Who it’s for: If you’re struggling with hitting thin/fat, slicing/hooking, then give the Smash Bag a try. It is particulary good for beginners who want to get the feel of making proper impact. It is perfect for practing in your house, backyard or at the range. 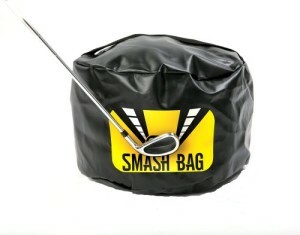 Overall rating: 4/5 – Great priced hitting bag, especially for beginner and intermediate golfers. 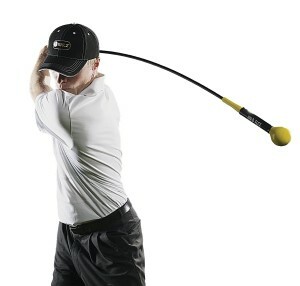 What it does: The Swingyde helps your arms and wrists stay in the proper position throughout the golf swing. It will help you develop a flatter swing with correct clubface alignment. This will allow you to make square contact, and consistently hit more accurate, straighter shots. The Swingyde is particularly useful for your backswing, when you can’t see your wrists. It will let you feel if your hands are in the proper “hinge” position. Who it’s for: The Swingyde is the best golf swing trainer for players that struggle with making square contact (clubface angle is too open, or too closed), or have problems keeping their front arm straight on their backswing. It is a very simple device and has been used by pros like Zach Johnson and Charles Howell III. 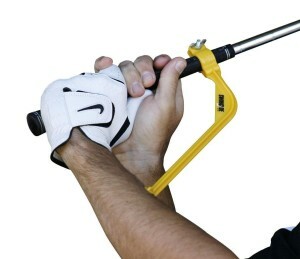 The Swingyde can be used by left or right handed players. Overall rating: 4/5 – Simple device that works well, but a bit overpriced for a piece of plastic. What it does: The Momentus Speed Whoosh helps activate your “fast twitch” muscles, which in turn helps you increase your swing speed and hit more explosive drives. The Speed Whoosh weighs the same as an average driver, but swings 20+ MPH faster. This unnatural speed helps activate your normally unused fast twitch muscles, and prepares them for use. After swinging the Speed Whoosh six times in a row, then switching to your normal driver, you will see an increase of 7-10 mph in club head speed. This can translate to an extra 20-25 yards of distance. The timing ball on the Speed Whoosh also lets you know if you are releasing on your downswing too early or too late. Who it’s for: The Speed Whoosh is best golf swing trainer for players trying to increase their swing speed and hit longer drives. It has been used by long-drive champions as well as many PGA tour professionals. It is not so useful for absolute beginners who are still working on their swing fundamentals. Overall rating: 4.2/5 – Will give you a extra yards on your drive, but won’t fix your slice/hook or other swing flaws. ‹ What’s the Best Putter Grip? 2 Pings/Trackbacks for "What’s the Best Golf Swing Trainer?"